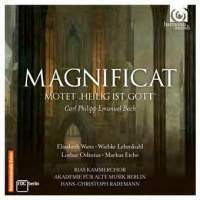 In part a homage to JS Bach’s setting, the Magnificat can sometimes outstay its welcome, above all in the gargantuan final fugue. Not here. Hans-Christoph Rademann and his Berlin forces make the strongest possible case for it, with fresh, athletic choral singing, playing of crackling, fizzing energy and excellent solo work. Elizabeth Watts is true and touching in ‘Quia respexit’ and contralto Wiebke Lehmkuhl brings a mingled warmth and purity to the beautiful ‘Suscepit Israel’. Lehmkuhl also launches the Heilig, where the recording creates an ideal spatial separation between the distant angelic choir and the more ‘present’ chorus of nations on earth, singing in keys remote from each other. This is the finest recording of CPE’s choral masterpiece I have heard. Crowning the disc, the D major Symphony combines torrential energy, lyrical tenderness (in the hauntingly scored Largo) and, not least, transparency of texture, so that flutes and oboe lines really tell against the composer’s trademark swirling, scurrying strings. This looks set to be one of the discs of the CPE Bach anniversary year.